I really liked the cover artwork for this one. There is something about the colors, the blues and greens, that attracted me 🙂 I didn’t have anything else by this author at the time (though I have since picked up a couple of her other works) so I figured I would give this a chance. I am glad I did, because it’s an interesting story. Yes, it does have some shoujo manga cliches, but really, it is difficult to avoid them these days, and they are sort of comforting sometimes 🙂 This series is still running. There are two volumes out as I write this (vol 2 just came out) and the end of volume 2 says that it will be continued in volume 3. I have no idea how long this series will be. The story reminds me a little bit of Bokura ga Ita in some ways, but maybe not quite as angsty. FUJISAKI Hyori is just a regular school girl. She doesn’t have a boyfriend, but she hasn’t exactly been looking for one either. All the girls in her class like to drool over MIZUNO Yuma, a cute guy from another class. Hyori thinks he is cute, and kind of likes him, but she isn’t about to go after him or anything. Things begin to change with the beginning of a new term, and the assignment of the class seating chart. Hyori finds herself sitting next to a guy she only vaguely knows, SASAMOTO Karen, and a girl she doesn’t know at all, KANBARA Kotone. 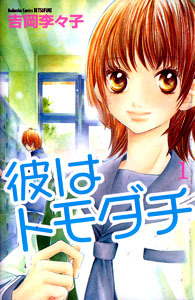 Hyori is a friendly girl, and she decides that the three of them are going to be good friends. Both Sasamoto and Kotone are surprised by Hyori’s cheerfulness, but accept her offer to be friends. Hyori is thrilled, and thinks it must be fate that brought the three of them together. Hyori is soon surprised to discover that Sasamoto is Yuma’s best friend, and that both Yuma and Sasamoto are childhood friends with Kotone. The four soon all become close, and Hyori couldn’t be happier. She begins to like Yuma more now, and confides her interest in Sasamoto. Sasamoto, for his part, is sort of amused by Hyori’s interest in Yuma, and doesn’t argue or complain when Hyori wants the four of them to be together so that she can see Yuma. However, it doesn’t take long for Hyori to sense something weird going on between Kotone, Sasamoto, and Yuma. Those three have been friends for years, since elementary school, and they seem to have some sort of history. Kotone has no other female friends, and Sasamoto seems to be very protective of her. Sasamoto won’t let Hyori call him by his first name, Karen (a name that makes Hyori laugh) but both Kotone and Yuma can (well, Yuma calls him “Ren”) because they are “special”. Things like this make Hyori feel a bit uncomfortable. But they are her friends, and are fun to be with. Eventually, Hyori finds herself falling for Sasamoto more than Yuma. Sitting next to him every day, and being with him all the time, she can’t help herself. However, Sasamoto gives off mixed signals. He seems to like Hyori too, yet there is this strange connection he has with Kotone and the way he is always protecting her. Hyori can’t be sure who he really likes. Meanwhile, something really odd is going on with Kotone. She has a mysterious claim on both Sasamoto and Yuma, and doesn’t seem to want to give either of them up. What is this selfishness? What exactly is her claim on both boys? Kotone seems like a shy, gentle, girl, but she may not be as nice as she seems. Can these four friends sort out their tangled relationships? Is it really fate that brought them all together, or something else?